The Contois family business just grew one size bigger with the opening of their second company, Hearth Heating, at 53 Cove Road, Dartmouth, adjacent to their other business, Phoenix Sheet Metal. Hearth Heating sells wood, pellet, coal and gas home-heating stoves and is part of a growing family-run business that includes Phoenix Sheet Medal, as well. Stephen Contois, 52, of Fairhaven opened Phoenix Sheet Metal on Main Street in Fairhaven in 1980. It moved to Huttleston Avenue and then to its present location, where it has been for six years. The companies also employ daughter Kelly Rebello, 33, who handles the office duties, and son Christopher, 30, who has worked with his father since he was 17. Christopher, with the help of his father and two additional employees, does installation, custom work and service calls. Incorporated in June, Hearth Heating offers a wide selection of wood, coal and pellet stoves to heat the home that are considered state-of-the-art in terms of efficiency and environmental protection. As the economy has soured and fuel prices have been a roller coaster ride, Steve says, “I’ve sold 85 tons of pellets this first year,” then added, “January and February will tell how business will go. The stoves they carry are touted as “green,” meaning they have built-in features that are more environmentally friendly than older models, as well as more efficient, he said. For instance, the three main lines they carry, Pacific Energy for wood, Alaska Stove for coal and Vista-Flame for pellets, have no dampers on the stoves, and they employ what is called a secondary burn, which reduces smoke, heat loss and greenhouse gases. Some of these stoves are capable of 82 percent efficiency of the fuel they burn, he said. 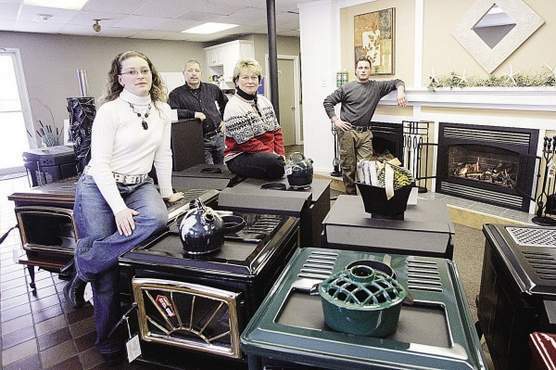 The company has done installations, fireplace inserts and custom work from the Cape to Rhode Island, and sells coal and pellets, and just recently began selling firewood… and have a large display of stoves on the premises. Reprinted from an article written by David Santos, Standard-Times correspondent. It appeared on January 18, 2009 in South Coast Today.